The season of good will is almost here, which means it’s time to start thinking about how you’re going to ‘trim up’ to help spread some Christmas cheer. So, to help you get into the spirit of things, we’ve pulled together a couple of ideas for festive, family friendly creations to make from Craftfoam over the coming weeks. This festive hanger is quick and simple to make. Just take a thin piece of green or grey Craftfoam and cut a snowman shape with a hole in the top, remembering to make it big enough so that the hanger easily fits over the door handle. Once you have your shape ready, smooth down the edges using fine sandpaper and paint white with non-solvent based oil paints such as acrylic or spray paints. When dry add the snowman’s features, you can either draw them on or one suggestion would be to glue pipe cleaners for the arms, small jewels for the buttons, felt for the scarf and a sprinkling of glitter for decoration. Once complete (and dry) your snowman is ready to hang. Craftfoam is available to buy in handy sheet sizes in a range of thicknesses and is easy to cut without the need for any specialist equipment, which makes it perfect for sculpting. Craftfoam can also be easily shaped and modelled using a variety of tools including hand or powered knives, and saws, drills and routers. 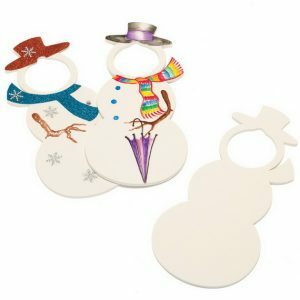 This and the fact it is extremely rigid means it is ideal for creating a festive village. First of all, you will need to cover a large sheet of Craftfoam with white paint and silver and white glitter for the base and leave it to one side. While the base is drying, create the house by cutting five squares for the walls and floor and two larger rectangles for the roof from another piece of Craftfoam. Using a craft knife, carve windows and a door out one of the squares, which will be the front of your house. Paint each shape the same colour, then when dry assemble the four walls on top of the floor, glue together using a robust PVA adhesive. Hold the pieces in place with large toothpicks or bamboo skewers; remove these once the walls are fixed, then place the rectangles together on top into a point, glue and fix in place to dry. 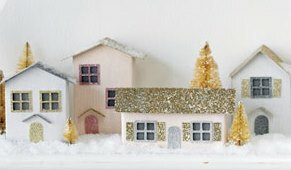 Once the glue is set, add some brick features, festive decorations and a sprinkling of glitter. Create as many houses as you need, but try to make them all a little different. When complete, place the houses on the large piece of white Craftfoam you painted earlier, add some Christmas trees and figurines, either sculpted from Craftfoam or readymade and if possible a little snow spray. Once assembled your village is ready to display as a fantastic festive centrepiece. Craftfoam can be conveniently delivered anywhere in the UK or you can collect your order from our dedicated warehouse in Sheffield, just off the M1 motorway. It can also be purchased as ready-to-use letters and numbers in various sizes, which makes creating Christmas signs and banners an easy task. For more information, click here or phone 0114 249 5626.